A year after the Millennium Bug failed to bring the City crashing down, a sense of anti-climax pervaded London; the sense of a change to come that had not yet arrived. A revolution was brewing in the music charts though: brave producers had begun moving back and forth across the lines historically separating Pop and R&B. The Neptunes made a slave out of Britney and got girlfriends for the members of N*SYNC, and still had the clout to pass Busta his Courvoisier and get grimey with Noreaga. Gwen sang for Eve, Christina and Pink with Mya and Kim. Meanwhile, Alicia sat behind a piano and made everyone fall for a sound that had started in '60s soul and found its way to her through doors opened in the late '90s by the likes of TonyToniTone, D'Angelo and Badu. A revolution was indeed happening in the charts……but it was nowhere to be found on the dance floors. When Zak Akhimien and Jean Claude Mighty first approached venues with the idea of providing spaces for people to listen and dance to black music - beyond the limited spectrum of mainstream R&B and commercial hip-hop - they could still hear the laughter as doors swung shut behind them, laughter that became subdued when they secured their first slot at Potion in Soho. Amplified was immediately different from your average night out in London. The ambiance was warm, friendly and infectious. No dress codes. No guest lists. No egos. Come as you are, be yourself and - above all - enjoy the music. People walked up to strangers and made friends, and the dance floor was regularly packed as the music outgrew neo-soul and hopped through time between rare grooves, jheri-curled soul, funk and classic hip-hop, before jumping forward into broken beat and electrosoul. 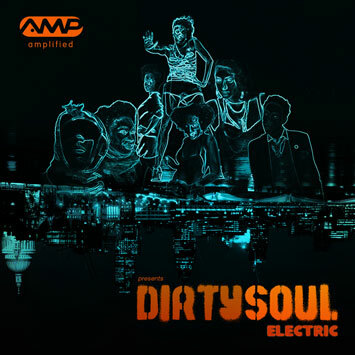 The Dirty Soul Trilogy is a three album series (1.Electric, 2.Accoustic 3.Live) exploring the alternative end of the soul spectrum. DST is rock & funk & folk/acoustic influenced soulful music that doesn't fall into RNB and doesn't fall in underground or "Beat Driven" soul music...it covers some of the most influential artists of the black music genre.